According to Harvard Medical School's April, 2010 edition of the Harvard Mental Health Letter  : Consensus exists that marijuana may be helpful in treating certain carefully defined medical conditions. In its comprehensive 1999 review, for example, the Institute of Medicine (IOM) concluded that marijuana may be modestly effective for pain relief (particularly nerve pain), appetite stimulation for people with AIDS wasting syndrome, and control of chemotherapy-related nausea and vomiting. An example of Cannabis sativa is shown in the image below. Upon waking, usually in the late morning, he invariably takes a bong hit or smokes a joint, to "get going." Then he spends a significant amount of time preparing breakfast—he feels the marijuana heightens his culinary senses and he takes great joy in cooking and preparing a large meal. Following breakfast, he retires back to his room in the basement and spends the next several hours playing video games online. When he senses that he is slowing down and feeling sleepy, he will smoke more marijuana because it gives him more energy and improves his mood. He will typically break from his immersion in the online gaming world for a late lunch, repeating his earlier efforts associated with breakfast. Occasionally, he will go to the local park to play basketball with the kids that are still in high school. Previously a successful athlete in high school, he feels like he has lost a step and his reflexes on the court are not as quick as they used to be. He has taken to selling a baseball card collection he painstakingly acquired when he was younger to raise money to pay for his marijuana, and, as that collection has dwindled, he has started to grow marijuana in his basement. He describes his first efforts as generating a meager plant that bears a resemblance to the sad Christmas tree from Charlie Brown. He does not understand why he no longer has a girlfriend or why it has become difficult to meet new girls. He seems perplexed by his last girlfriend's complaints that he had become boring and it seemed like he was "letting life pass him by." He reports that his parents seem to be growing increasingly frustrated with him and reports arguing with them over his marijuana use—they identify it as a problem, he disagrees. He no longer goes out at night and instead spends most of his time smoking and playing video games alone in his room in the basement. He denies any difficulty sleeping, although he does not remember dreaming anymore and cannot remember the last dream he had. He reports some cognitive difficulties associated with decreased ability to concentrate and some short-term memory problems. He reports feeling occasionally irritable when too much time passes in between smoking and feels that marijuana makes him less irritable. He is interested in being more social, more engaged, and feeling like he is achieving his goals but seems unable to explain why he cannot accomplish what he sets out to do. He does not seem to appreciate that his heavy and chronic marijuana use is a significant cause of his symptoms. He indicates that overall he enjoys smoking marijuana and believes it makes it easier for him to enjoy his days, which have become more difficult lately as he appreciates the stark difference between the quality of life he is enjoying compared with his peers who are now working or attending college. The major psychoactive component of marijuana is tetrahydrocannabinol (THC). Cannabidiol is considered the most abundant nonpsychoactive cannabinoid in cannabis. It is the constituent thought now to reduce many of the undesirable effects of THC; it significantly reduces the anxiety and psychoticlike symptoms that can be associated with THC. It is currently under investigation for use as an anxiolytic and antipsychotic. Double-blinded tests on volunteers have demonstrated its usefulness as an anxiolytic in anxiogenic test situations. Animal and human studies also suggest that it has a pharmacologic profile similar to atypical antipsychotics; as such, cannabis is being considered as an alternative effective treatment for schizophrenia. However, THC has been more extensively studied; therefore, much of our understanding of the physiological changes induced by marijuana is predicated on the binding and metabolism of THC. Smoking is the most common and efficient means of ingestion, with the dose being titrated by the user through varying the depth and frequency of inhalation; thus, the delivery mechanism poses a challenge for cannabis as a medication. THC can also be extracted by fat-containing foods or dissolved in oil for pharmaceutical purposes. Dronabinol (Marinol): This drug is indicated for anorexia associated with weight loss in patients with AIDS and nausea and vomiting associated with cancer chemotherapy in patients who have not responded adequately to conventional antiemetic treatments. Nabilone (Cesamet): This drug is indicated for nausea and vomiting associated with cancer chemotherapy in patients who have not responded adequately to conventional antiemetic treatments. After intake, THC undergoes metabolism to an inactive metabolite (8-11-DiOH-THC) and to a highly active metabolite (11-OH-delta-9-THC). The half-life of THC is approximately 4 hours. The long life of the active metabolite is explained by the incorporation of the compound in lipid storage depots and similar storage sites in muscle tissue. Thirty to 60% of THC, in all forms, is excreted in feces; the remaining amount is excreted in urine. The endocannabinoid system is now understood to be a complex lipid–signaling network in which different proteins play specific roles in controlling or modulating a variety of physiological and pathophysiological processes. 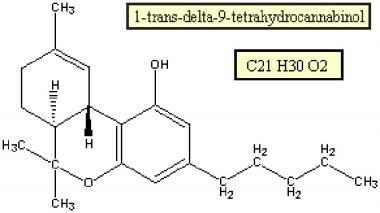 Delta-9-THC is believed to exert all of its effects on the brain via the CB1 receptor. High densities of CB1 receptors are found in the cerebral cortex (especially frontal), basal ganglia, cerebellum, anterior cingulate cortex, and hippocampus. They are relatively absent in the brainstem nuclei. Stimulation of these receptors causes monoamine and amino acid neurotransmitters to be released. Endogenous ligands for CB1 receptors include anandamide and 2-arachidonylglycerol—the endocannabinoids. Cannabis dependence is associated with morbidity, including impaired occupational and social functioning. Cannabis use can be comorbid with the presence of other psychiatric disorders, characterized by a disordered thought process, perceptual disturbances, or symptoms of anxiety. When marijuana is believed to be the etiologic agent, clinicians may diagnose a cannabis-induced disorder. A study conducted in Germany stated that the use of cannabis in adolescence is a risk factor for the development of incident psychotic symptoms. This study was not without significant limitations; the study ignored the impact of genetic inheritability as a risk factor in the development of psychosis, the impact of confounding risk factors associated with other drug use (eg, PCP, methamphetamine), and the authors’ assumption that transient psychotic experiences were a surrogate for clinically relevant psychosis. A meta-analysis examining 83 different studies reached similar conclusions, reporting that cannabis use was associated with an earlier age of onset of psychosis. Unfortunately despite a dearth of evidence, the authors argued that this temporal association supported their personal view that marijuana was an etiological risk factor for the development of psychosis. The exact role marijuana plays in the development of psychosis and whether or not it has any causal role remains a matter of debate and controversy. Marijuana abuse may be a factor in vehicle or machinery accidents because intoxication affects coordination and motor performance. Perform the appropriate tests for use of marijuana after these accidents. Use, abuse, and dependence on marijuana tends to cut across demographics, including age. Cohen PJ. Medical marijuana: the conflict between scientific evidence and political ideology. Part two of two. J Pain Palliat Care Pharmacother. 2009. 23(2):120-40. [Medline]. Remnick D. Going the Distance. The New Yorker. Available at http://www.newyorker.com/reporting/2014/01/27/140127fa_fact_remnick?currentPage=all. Accessed: May 25, 2014. O'Brien M. Poll: Majority of Americans Support Efforts to Legalize Marijuana. NBC News. 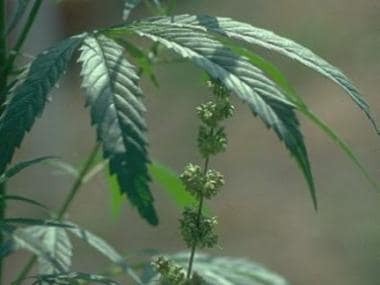 Available at http://www.nbcnews.com/storyline/legal-pot/poll-majority-americans-support-efforts-legalize-marijuana-n17416. Accessed: May 25, 2014. Frosch D. V.A. Easing Rules for Users of Medical Marijuana. The New York Times. Available at http://www.nytimes.com/2010/07/24/health/policy/24veterans.html?pagewanted=1&_r=1. Accessed: July 24, 2010. MacCoun R, Reuter P. Evaluating alternative cannabis regimes. Br J Psychiatry. 2001 Feb. 178:123-8. [Medline]. Reinarman C, Cohen PD, Kaal HL. The limited relevance of drug policy: cannabis in Amsterdam and in San Francisco. Am J Public Health. 2004 May. 94(5):836-42. [Medline]. [Full Text]. van den Brink W. Forum: Decriminalization of cannabis. Curr Opin Psychiatry. 2008 Mar. 21(2):122-6. [Medline]. Abrams DI, Jay CA, Shade SB, et al. Cannabis in painful HIV-associated sensory neuropathy: a randomized placebo-controlled trial. Neurology. 2007 Feb 13. 68(7):515-21. [Medline]. Miller MC, et al. Medical marijuana and the mind. Harvard Mental Health Letter. April 2010. 26:1-4. Pletcher MJ, Vittinghoff E, Kalhan R, et al. Association between marijuana exposure and pulmonary function over 20 years. JAMA. 2012 Jan 11. 307(2):173-81. [Medline]. Koppel BS, Brust JC, Fife T, Bronstein J, Youssof S, Gronseth G, et al. Systematic review: efficacy and safety of medical marijuana in selected neurologic disorders: report of the Guideline Development Subcommittee of the American Academy of Neurology. Neurology. 2014 Apr 29. 82(17):1556-63. [Medline]. [Full Text]. American Psychiatric Association. Diagnostic and Statistical Manual of Mental Disorders, Fifth Edition, DSM-5. Washington D.C.: American Psychiatric Association; 2013. Burstein SH, Zurier RB. Cannabinoids, endocannabinoids, and related analogs in inflammation. AAPS J. 2009 Mar. 11(1):109-19. [Medline]. [Full Text]. Gertsch J, Pertwee RG, Di Marzo V. Phytocannabinoids beyond the Cannabis plant - do they exist?. Br J Pharmacol. 2010 Jun. 160(3):523-9. [Medline]. [Full Text]. Ringen PA, Vaskinn A, Sundet K, et al. Opposite relationships between cannabis use and neurocognitive functioning in bipolar disorder and schizophrenia. Psychol Med. 2009 Nov 6. 1-11. [Medline]. Substance Abuse and Mental Health Services Administration. Results from the 2014 National Survey on Drug Use and Health: National Findings. Rockville, MD: Office of Applied Studies, NSDUH Series H-30;. 2014. DHHS Publication No. SMA 06-4194:[Full Text]. National Institute on Drug Abuse: Marijuana. National Institute on Drug Abuse. Available at https://www.drugabuse.gov/drugs-abuse/marijuana. Stinson FS, Ruan WJ, Pickering R, Grant BF. Cannabis use disorders in the USA: prevalence, correlates and co-morbidity. Psychol Med. 2006 Oct. 36(10):1447-60. [Medline]. Annual Report 2012: The State of the Drugs Problem in Europe. European Monitoring Centre for Drugs and Drug Addiction (EMCDDA). Available at http://www.emcdda.europa.eu/attachements.cfm/att_190854_EN_TDAC12001ENC_.pdf. Wilson N, Cadet JL. Comorbid mood, psychosis, and marijuana abuse disorders: a theoretical review. J Addict Dis. 2009 Oct. 28(4):309-19. [Medline]. Bosker WM, Kuypers KP, Theunissen EL, Surinx A, Blankespoor RJ, Skopp G, et al. Medicinal THC (dronabinol) impairs on-the-road driving performance of occasional and heavy cannabis users but is not detected in Standardized Field Sobriety Tests. Addiction. 2012 May 4. [Medline]. Barrigón ML, Gurpegui M, Ruiz-Veguilla M, et al. Temporal relationship of first-episode non-affective psychosis with cannabis use: a clinical verification of an epidemiological hypothesis. J Psychiatr Res. 2010 May. 44(7):413-20. [Medline]. Foti DJ, Kotov R, Guey LT, Bromet EJ. Cannabis use and the course of schizophrenia: 10-year follow-up after first hospitalization. Am J Psychiatry. 2010 Aug. 167(8):987-93. [Medline]. [Full Text]. Large M, Sharma S, Compton MT, Slade T, Nielssen O. Cannabis Use and Earlier Onset of Psychosis: A Systematic Meta-analysis. Arch Gen Psychiatry. 2011 Jun. 68(6):555-61. [Medline]. Peter Hecht. Report: African-Americans disproportionately targeted for pot. The Sacramento Bee. Available at http://blogs.sacbee.com/weed-wars/2010/06/report-african-americans-disproportionately-targeted-for-pot.html. Accessed: August 3, 2010. Lopez-Quintero C, Perez de los Cobos J, Hasin DS, et al. Probability and predictors of transition from first use to dependence on nicotine, alcohol, cannabis, and cocaine: results of the National Epidemiologic Survey on Alcohol and Related Conditions (NESARC). Drug Alcohol Depend. 2011 May 1. 115(1-2):120-30. [Medline]. [Full Text]. Preuss UW, Watzke AB, Zimmermann J, Wong JW, Schmidt CO. Cannabis withdrawal severity and short-term course among cannabis-dependent adolescent and young adult inpatients. Drug Alcohol Depend. 2010 Jan 15. 106(2-3):133-41. [Medline]. Budney AJ, Hughes JR, Moore BA, Vandrey R. Review of the validity and significance of cannabis withdrawal syndrome. Am J Psychiatry. 2004 Nov. 161(11):1967-77. [Medline]. Allsop DJ, Norberg MM, Copeland J, Fu S, Budney AJ. The Cannabis Withdrawal Scale development: Patterns and predictors of cannabis withdrawal and distress. Drug Alcohol Depend. 2011 Dec 1. 119(1-2):123-9. [Medline]. Musshoff F, Madea B. Review of biologic matrices (urine, blood, hair) as indicators of recent or ongoing cannabis use. Ther Drug Monit. 2006 Apr. 28(2):155-63. [Medline]. Carpenter KM, McDowell D, Brooks DJ, Cheng WY, Levin FR. A preliminary trial: double-blind comparison of nefazodone, bupropion-SR, and placebo in the treatment of cannabis dependence. Am J Addict. 2009 Jan-Feb. 18(1):53-64. [Medline]. [Full Text]. Degenhardt L, Dierker L, Chiu WT, et al. Evaluating the drug use "gateway" theory using cross-national data: consistency and associations of the order of initiation of drug use among participants in the WHO World Mental Health Surveys. Drug Alcohol Depend. 2010 Apr 1. 108(1-2):84-97. [Medline]. [Full Text]. Agrawal A, Lynskey MT. The genetic epidemiology of cannabis use, abuse and dependence. Addiction. 2006 Jun. 101(6):801-12. [Medline]. Degenhardt L, Hall W. Is cannabis use a contributory cause of psychosis?. Can J Psychiatry. 2006 Aug. 51(9):556-65. [Medline]. Di Forti M, Morgan C, Dazzan P, et al. High-potency cannabis and the risk of psychosis. Br J Psychiatry. 2009 Dec. 195(6):488-91. [Medline]. [Full Text]. Gruber SA, Yurgelun-Todd DA. Neuroimaging of marijuana smokers during inhibitory processing: a pilot investigation. Brain Res Cogn Brain Res. 2005 Apr. 23(1):107-18. [Medline]. Haney M, Rabkin J, Gunderson E, Foltin RW. Dronabinol and marijuana in HIV(+) marijuana smokers: acute effects on caloric intake and mood. Psychopharmacology (Berl). 2005 Aug. 181(1):170-8. [Medline]. Hurd YL, Wang X, Anderson V, Beck O, Minkoff H, Dow-Edwards D. Marijuana impairs growth in mid-gestation fetuses. Neurotoxicol Teratol. 2005 Mar-Apr. 27(2):221-9. [Medline]. Iversen L. Cannabis and the brain. Brain. 2003 Jun. 126(Pt 6):1252-70. [Medline]. [Guideline] Kleber HD, Weiss RD, Anton RF, et al. Treatment of patients with substance use disorders, second edition. American Psychiatic Association. Am J Psychiatry. 2006 Aug. 163(8 Suppl):5-82. [Medline]. Ramaekers JG, Moeller MR, van Ruitenbeek P, et al. Cognition and motor control as a function of Delta9-THC concentration in serum and oral fluid: limits of impairment. Drug Alcohol Depend. 2006 Nov 8. 85(2):114-22. [Medline]. Strasser F, Luftner D, Possinger K, Ernst G, Ruhstaller T. Comparison of orally administered cannabis extract and delta-9-tetrahydrocannabinol in treating patients with cancer-related anorexia-cachexia syndrome: a multicenter, phase III, randomized, double-blind, placebo-controlled clinical trial from the Cannabis-In-Cachexia-Study-Group. J Clin Oncol. 2006 Jul 20. 24(21):3394-400. [Medline]. Whitcomb D. Marijuana legalization will be on California ballot. Reuters. Available at http://www.reuters.com/article/idUSTRE62O08U20100325. Accessed: July 24, 2010. Zuardi AW, Crippa JA, Hallak JE, Moreira FA, Guimaraes FS. Cannabidiol, a Cannabis sativa constituent, as an antipsychotic drug. Braz J Med Biol Res. 2006 Apr. 39(4):421-9. [Medline]. The authors and editors of Medscape Reference gratefully acknowledge the contributions of previous authors Robert C Daly, MB, ChB, MPH, BCh; Can M Savasman, MD; Caroline Fisher, MD, PhD; and Lina Cassandra Vawter, MD to the development and writing of this article.